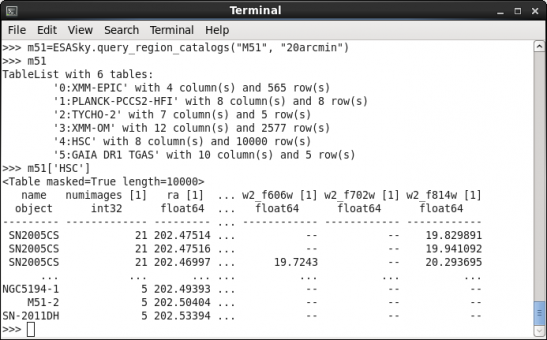 The ESASky module in Astroquery is basically the Python interface for ESASky‘s data. You can read more about exactly what ESASky is here, but to summarize ESASky is a website that gives users a single, easy-to-use interface for accessing petabytes of data from all ESA telescopes as well as an ever increasing list of telescopes from other institutions like JAXA, NASA, ALMA, and ESO. The ESASky module fuses the thriving Python astronomy community with the power of ESASky. The community has among other things developed the Astroquery package, which is an open source project, currently is maintained by Adam Ginsburg. This project is an affiliated package of the larger Astropy project, which tries to solve the needs among the growing community. The Astropy project contains loads of different tools for scientists to use, while the Astroquery package focuses on fetching data from telescopes both on earth and in space. The ESASky module allows users to download both calculated metadata for the different mission catalogs and the FITS files, which are filled with both images and science data. This gives users access to petabytes of data from the world’s telescopes and allows easy interactions with their favorite Python tools. The Astroquery package can be found here and the latest documentation for the ESASky module can be found here. Currently, I am the sole developer and maintainer of this module.